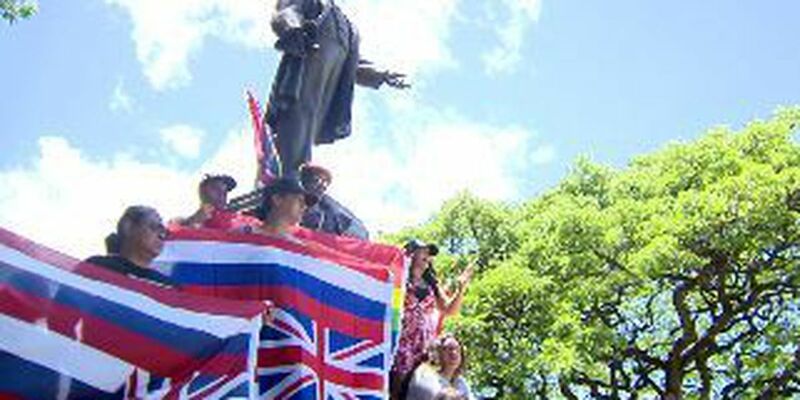 HONOLULU (HawaiiNewsNow) - Hawaiian activists are standing in solidarity against racism and hate displayed during a violent rally in Charlottesville, Virginia last weekend. Dozens marched down King Street on Sunday chanting, carrying signs and holding the Hawaii state flag upside down, representing a nation in distress. They then gathered around the statue of President William McKinley at McKinley High School. "He led the takeover of Hawaii, Puerto Rico, Guam, the Philippines and Cuba," said Khara Jabola-Carolus, co-founder of AF3IRM Hawaii. "His legacy is painful for people of color in Hawaii and throughout the pacific." The high school roped off the oval lawn that holds bronze statue in anticipation of Sunday's protest, but it wasn't enough to stop activists from surrounding it. "President William McKinley is our Robert E. Lee to pacific islanders," Jabola-Carolus said. "We are not assimilating to white supremacy," said activist Grace Caligtan. "We are not holding our tongues to make you comfortable. We are speaking the truth and speaking it in volumes." The peaceful demonstration prompted Honolulu police and the school's vice principal to arrive, though no one was arrested. "As long as they come and do things near the statue, we just didn't want to see any graffiti or possibly pulling it down, that was a big concern," said Ricky Price, one of four vice principals at McKinley High School. Past movements to remove the statue and rename McKinley High have tried and failed, but activists say they plan to re-launch a petition to finally get the job done.